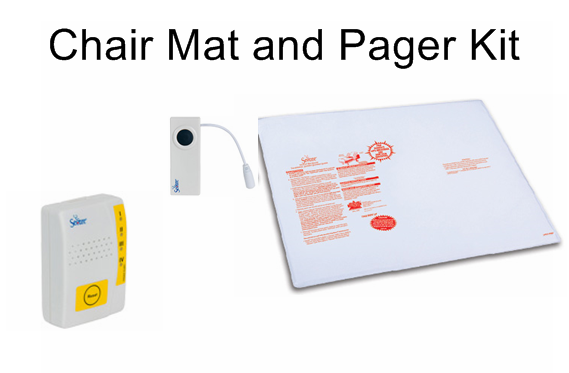 This Chair Alarm and Pager kit is ideal for people looking after loved one who may not be as mobile as they once were. If a loved one gets up from the chair an alarm will be created sending a signal to the pager letting you know no matter where you are in the house. The alarm can be silenced locally so that only the pager will alarm if the person gets up. Alarm can also be set to sound locally and/or vibrate. The Pad will last much longer than the warranty if user instructions are followed correctly. The Secure® Wireless chair Exit Alarm w/ Wireless Caregiver Pager is the perfect fall management product solution for at-home caregivers and health care facilities - Effectively alerts caregiver when a patient or loved one attempts to exit a bed - Package includes 1 Bed Sensor Pad, 1 Sensor Pad Transmitter and 1 Wireless Caregiver Pager. Chair sensor pad connects to the wireless Sensor Pad Transmitter that sends a wireless alert signal to the Caregiver Pager when pressure is removed from the bed sensor pad - Sensor Pad Transmitter also features a call button that can be used by a patient to alert the Caregiver Pager when help is needed! 12" x 30" ultra-thin chair sensor pad features antimicrobial, incontinent-proof, latex-free, non-skin sensitive cover material - Sensor pad is comfortable and durable for continuous use, and can be folded without damage for storage - Sensor pad features durable metal connecting pin that will not break like the easily breakable plastic connectors found on all other sensor pads. There is a 45 Day Warranty with the Chair Pad. The Pad will last much longer than the warranty if user instructions are followed correctly. Caregiver Pager features multiple alert sounds and a vibrating feature - Pager can be set to... 1.) Sound Only 2.) Sound+ Vibrate 3.) Vibrate Only - The pager features a belt/waist clip to attach to users belt for constant patient monitoring - Monitoring distance up to 150 meters. in an open area (walls and other interference may decrease operating distance) - Backed by Personal Safety Corporation's one year warranty and exceptional customer service - Trust in a brand used in thousands of concerned care facilities throughout the US, Canada and Europe Since 1991!